Fill in your details below and we will let you know within 24 hours if we can get Murder Mystery: Pasta, Passion, & Pistols to you with haste! 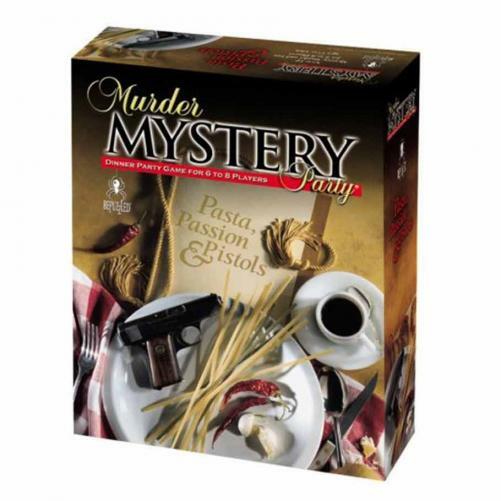 "The succulent aroma of home cooked pasta is drifting from New York City's most popular Italian eatery, La Speranza, but something else is heating up the kitchen...cold blooded murder! Restauranteur, Pepi Roni, has been shot in the back with his own pistol. Tonight his family and friends will gather to pay their respects to poor Pepi, but one of the guests won't be shedding any tears." The suspects: Rocco Scarfazzi, Bo Jalais, Mama Rosa, Angel Roni, Marco Roni, and Tara Misu. Extra guests: Father Al Fredo and Clair Voyant.